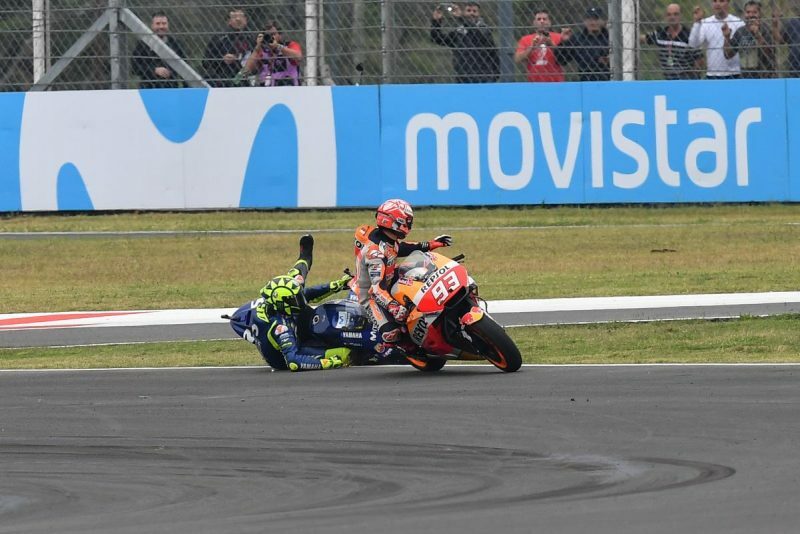 Cal Crutchlow won an Argentina MotoGP which had just about everything, including a third penalty for Marc Marquez after he bumped Valentino Rossi and caused the Italian to crash. LCR Honda’s Crutchlow took a third career MotoGP race win while Jack Miller finished fourth and neither Marquez nor Rossi scored points. Marquez was 19th after a first ride-through penalty and had to twice pass Aleix Espargaro on his way back through the field after officials determined that the first was too aggressive and ordered him to cede the position. He was back up to seventh on Lap 20 when he lunged at Rossi and made contact with the Movistar Yamaha, causing #46 to run onto the wet grass and fall. Marquez took the chequered flag in fifth position, at which time he was issued a 30-second penalty which relegated #93 to 18th, one position ahead of Rossi. Race start had been delayed a first time to allow all riders except for pole-sitter Miller to switch from wets to slicks, with the track drying quickly after a shower. Miller was already on slicks and started alone with the rest of the field several rows behind, a compromise reached to avoid a crowded pit lane start. A second delay came when Marquez’s Repsol Honda stalled on the grid, but he managed to get it refired and take up his position, despite being told to start from pit lane. Miller led away on his Pramac Ducati but Marquez stormed into the lead and pulled clear before being handed a ride-through penalty. The Spaniard filed into pit lane on Lap 7 and Miller regained the lead, but with Alex Rins, Johann Zarco, and Crutchlow making up ground behind him. Rins and Miller would pass each other a number of times and it was the Suzuki Ecstar rider leading when he ran wide on Lap 17 and drop to fourth. Miller made an error of his own a lap later and lost touch with the front-runners, now headed by Crutchlow from Zarco and Rins. Zarco passed Crutchlow on Lap 20 but the Brit got back in front of the Tech3 Yamaha rider on the second-last of 24 laps. 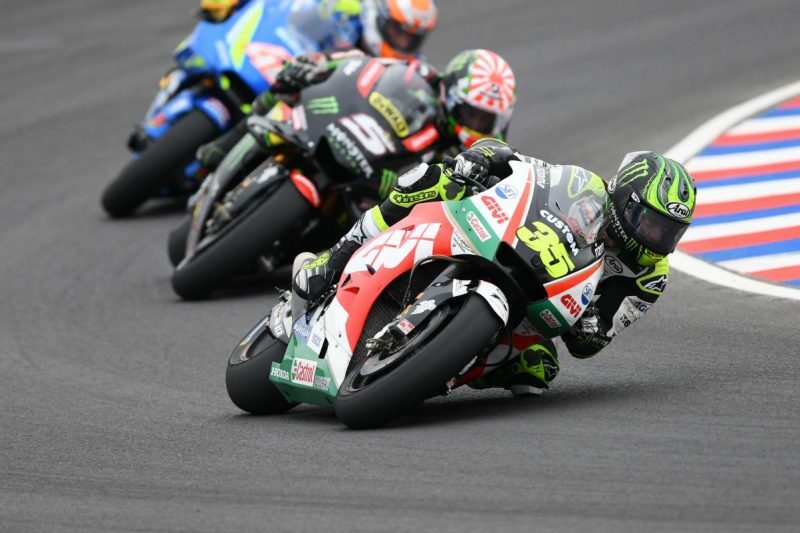 Crutchlow went on to a narrow win over Zarco, with Rins on the podium for the first time in the premier class. Maverick Viñales (Movistar Yamaha) finished fifth, ahead of Andrea Dovizioso (Ducati Team), Tito Rabat (Avintia Ducati), Andrea Iannone (Suzuki Ecstar), rookie Hafizh Syahrin (Tech3 Yamaha), and Danilo Petrucci (Pramac Ducati). Jorge Lorenzo battled to 15th on the second factory Ducati while Dani Pedrosa crashed his factory Honda early in the race after contact with Zarco. Crutchlow now leads the championship by three points over Dovizioso, with Round 3 in the United States in a fortnight (April 20-22 local time).